If your house is anything like mine, your floor is littered with hearts and stickers, confetti and sparkles, the uncontainable detritus of the month-long operation that consumes our home at this time every year: making Valentines. The glue! The glitter! The little girls cutting hearts and hearts and hearts and hearts, and the thousands of tiny scraps of paper that float to every corner of the floor! The never-ending sweeping…. I mostly try to just smile and nod, enjoying the spectacle and vaguely hoping that we’ll manage to reclaim the table in time for dinner each night. As you probably know, I prefer to make my own messes in the kitchen. With Valentines Day coming up this week, if you’re like me, you might like to know that you don’t have to settle for crumbly, flavorless conversation hearts with pre-printed messages. Since I’m rarely organized to make holiday treats before the day itself, I’ll refer you back to a post from last year: Make your own easy DIY conversation hearts and express your true feelings instead! If that’s too extreme for you, though, you should probably at least make your Valentine a plate of cookies. Hope your homes are full of sweetness this week! This entry was posted in Baking, Cookies, Desserts, Easily Multiplies to Feed a Crowd, Feeding Kids, Food, Recipes and tagged candy, conversation hearts, cookies, DIY, hearts, homemade, Valentines Day on February 8, 2013 by emmycooks. Yes, I like vegetables, but I also like cookies. And let me tell you, having three little girls is a good excuse to make cookies. Lots of cookies. 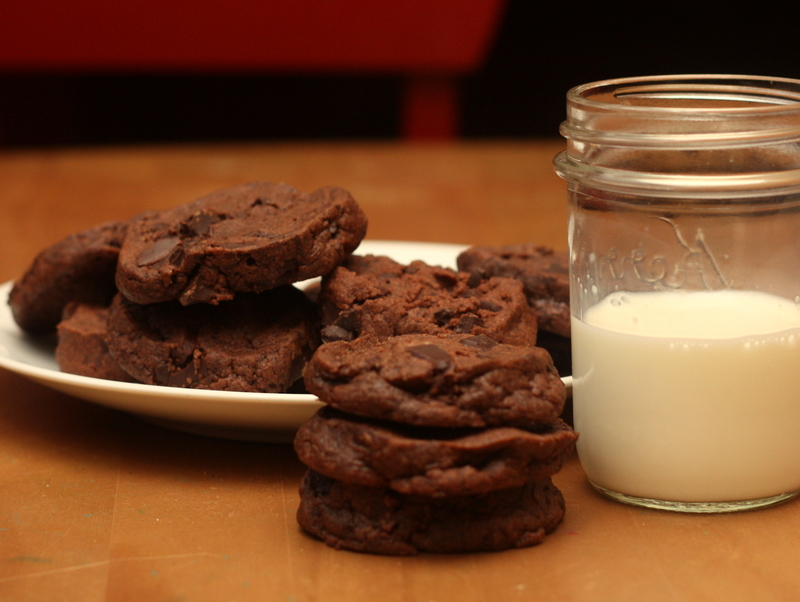 Chocolate Chocolate Cookies. 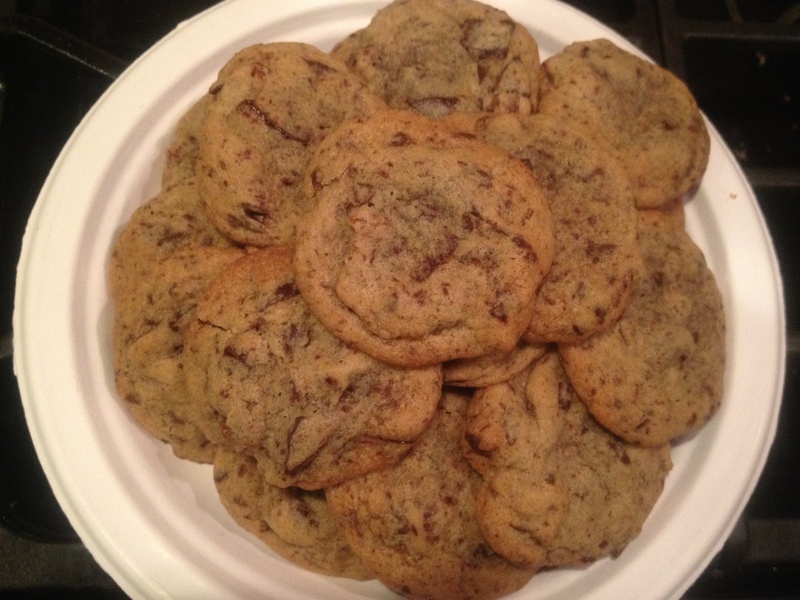 Whole Wheat Chocolate Chip Cookies. Bittersweet Chocolate Dried Apricot Cookies. Hazelnut Tea Cookies. Savory Oatmeal Cookies with Rosemary and Black Pepper. Butterscotch cookies (go ahead, sandwich them with Nutella). Those cookies above, as you may notice, do not fall into the health food category. And that’s ok. But these cookies below? They come awfully close. And they’re lovely. And I will be making them often. And I will let my kids eat them for breakfast. The original recipe comes from Hannah, a fellow Seattleite, chef, and writer of Blue Kale Road. You should go read her post, a sweet reflection on enjoying the ordinary moments in life, and then you should go to the kitchen and make these cookies. 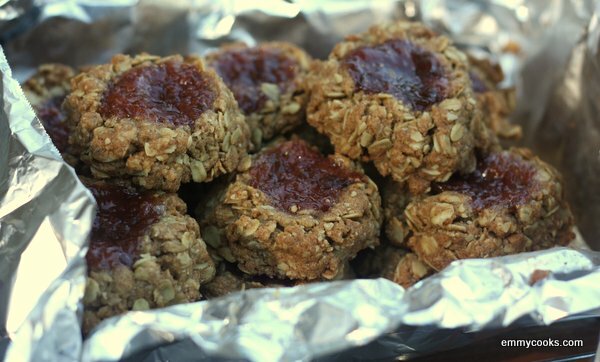 This entry was posted in Baking, Cookies, Desserts, DIY, Feeding Kids, Food, Recipes, Snacks and Apps, Vegan or Would-Be-Just-As-Good-Vegan and tagged cookies, healthy recipes, vegan cookies, vegan recipes on September 8, 2012 by emmycooks. 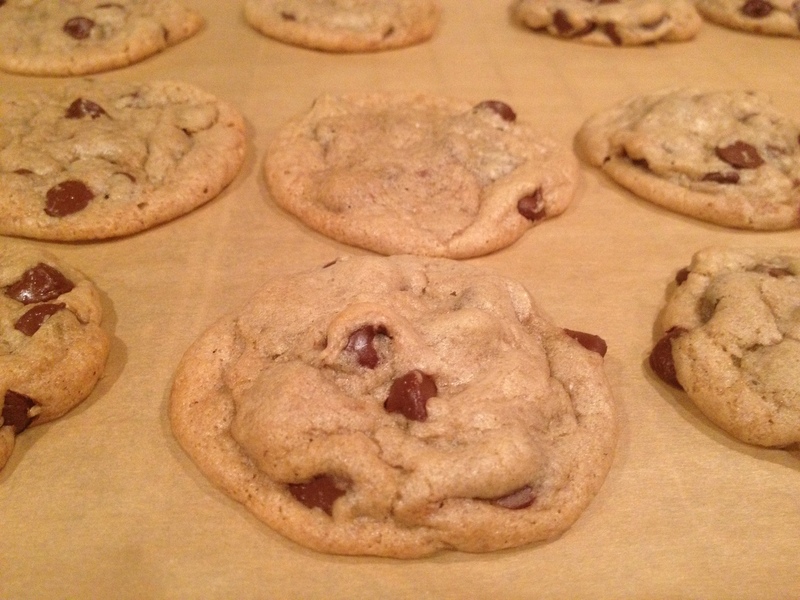 This has become my go-to chocolate chip cookie recipe. It’s barely adapted from Smitten Kitchen, a site that I like because I feel confident that Deb cares just as much as I do about food being very, very delicious. And these cookies fit the bill: they’re classic, chock-full of chocolate, and chewy with a crispy edge. What more can you ask of a cookie? Well, I’ll tell you the final way in which they’re perfect: they’re made with melted butter. If you, like me, never plan ahead to have softened butter waiting on your counter to make cookies, this will mean something to you. And if it means nothing to you, lucky you, just go ahead and love these cookies for their other charms. This entry was posted in Baking, Cookies, Desserts, DIY, Feeding Kids and tagged baking, chocolate, cookies, cooking, dessert, DIY, family, food, homemade, kids, lifestyle, recipes on May 9, 2012 by emmycooks. There has long been a sweet little cafe in Seattle called Macrina Bakery. It has a few outposts now, and any of them are fortunate places to find yourself at lunchtime or when you need an afternoon pick-me-up. Or for breakfast, of course. Or whenever. Freshly baked breads, good coffee, great pastries, a handful of equally decadent savory options to round out the offerings. And lucky for us, they published a cookbook. I was in search of a unique chocolate chip cookie. Do yourself a favor and don’t waste time idly Google-ing “unique chocolate chip cookie.” Sometimes the internet is useful, and sometimes it’s not. I needed a cookbook. My cookbook collection is largely geared toward the savory side of life, it turns out. What are your favorite baking books? I picked up one of the few I own, Leslie Mackie’s Macrina cookbook, and luckily it came through for me. Chopped bittersweet chocolate and dried apricots certainly contribute generously to this cookie’s appeal. But there’s another deeper, darker secret: the mere half teaspoon of finely ground espresso. 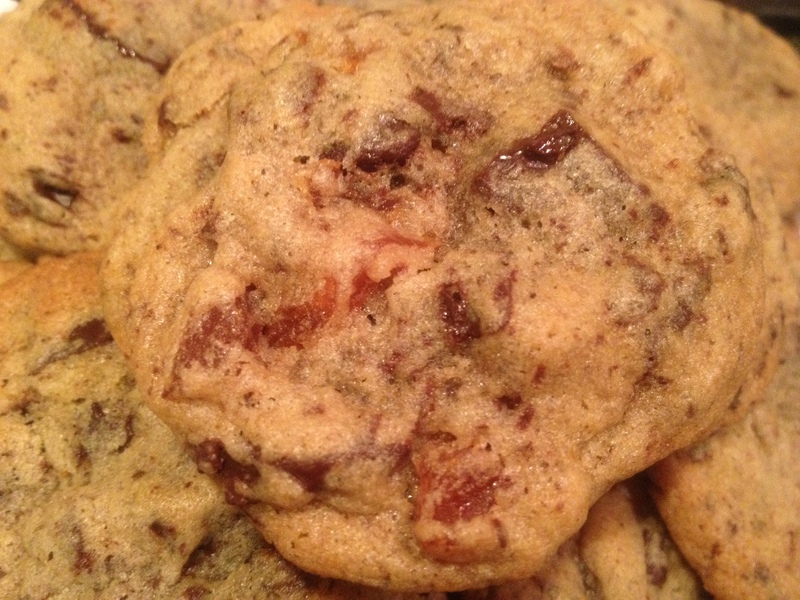 It lends a rich, difficult-to-place depth to the cookie’s flavor, firmly cementing its status as THE unique chocolate chip cookie I was looking for. One friendly tip. The recipe instructs you to chill the dough before baking it. That is not the kind of thing I like to do. If you know me, you know that I do everything at the last minute, which means that when I make cookies they are going straight into the oven because I need them to be ready ten minutes from now. But in the spirit of experimentation, I also set aside a bit of dough and baked it the next day. The cookies were even better. The flavor was a bit more caramelized, deeper. The original cookies were good. The chilled batch was amazing. So hey, what’s your favorite baking book? I like easy, unfussy, not insanely decadent. I can certainly recommend the Macrina cookbook (and not just on the strength of this recipe; I’ve made some others, and had still others made for me, all great). I also love Rustic Fruit Desserts, by Cory Schreiber and Julie Richardson, and I am looking forward to pulling that one out more come summertime. Bittersweet Chocolate and Dried Apricot Cookies: In a large bowl, combine 2 1/2 c. flour, 1 tsp. baking soda, 1/4 tsp. salt, 1/2 tsp. finely ground espresso beans, 10 oz. 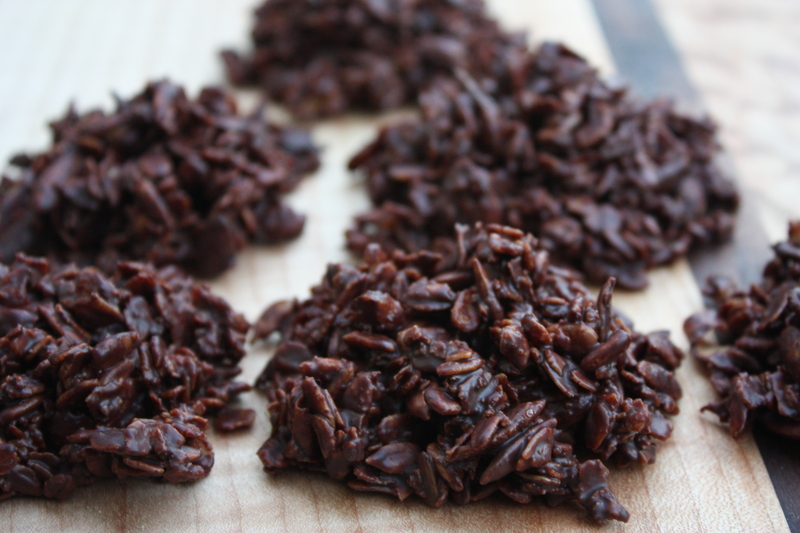 chopped bittersweet chocolate, and 3/4 c. finely diced unsulfured dried apricots. Cream 8 oz. (2 sticks) butter with 3/4 c. granulated sugar and 3/4 c. light brown sugar on medium speed for 5 minutes. Add 2 eggs and 2 tsp. vanilla, scraping down the bowl as you go. Add half of dry ingredients, mix until incorporated, then add other half and repeat. Refrigerate the dough for one hour (or up to 4 days) if you can possibly wait. Roll into 1″ balls, flatten slightly, and bake 8-10 minutes on parchment-lined sheets at 350, until the edges are golden brown. This entry was posted in Baking, Cookies, Desserts, Easily Multiplies to Feed a Crowd and tagged baking, chocolate, cookies, cooking, dessert, DIY, family, food, homemade, kids, lifestyle, recipes on April 4, 2012 by emmycooks.